This drawing is one of a series of studies produced by the artist in 1963 as part of his investigations into the dynamic potential of creating moving Constructions and Mobiles. These 2-dimensional studies explored and manipulated the tensions between positive shapes / forms and negative spaces. In this drawing, the artist proposed that the black shapes - like wings - would turn on their axes to produce a series of different negative shapes, with small, coloured semi-circles moving inside them; an idea realised in a Construction that was exhibited at the important and influential Drian Galleries in March-April 1965. But the study itself is much more than a technical record. First of all, it is wonderfully bold. It is executed on Imperial paper and, at 22 inches by 30 inches, these large sheets were much favoured in art colleges in the 1950s and 60s. Their very size eschewed timidity (when faced with a nearly blank sheet of Imperial paper, I can still hear my own tutor’s oft-repeated encouragement to 'make a statement!'). Accordingly, this study announces itself with tremendous confidence. The strongly inscribed, elemental 'wings' press hard against the paper’s margins, as if challenging the limitations, creating a space of their own. 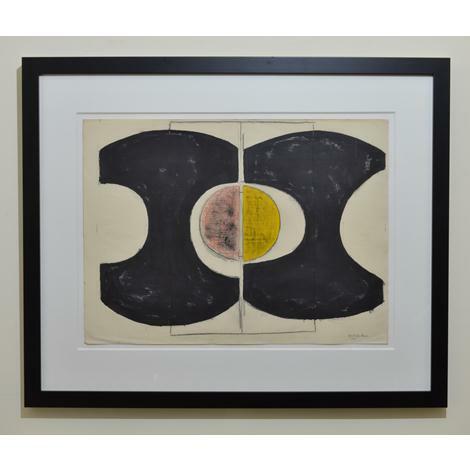 At the same time, the sharp contrasts of black and white are mediated by the textured finish of the 'wings' and the shadowed hue of the paper; and the bruised pink and yellow discs vie with one another for space, appearing to shift, back and forth, before one's eyes. This is a fascinating piece, which is both a record of a particular intellectual and cultural debate and a dynamic work of art.